The settled weather of the last 2 weeks was coming to an abrupt end with the approach of Storm Katie due to hit full force on Easter day and Bank holiday Monday. The only day which looked promising was in fact Good Friday, As you can see from the photo, Good Friday was really quite special with wall to wall sunshine and light/moderate winds. This photo was taken by my parents from the Sandbanks chain ferry, it’s not often to get pictures of your own boat under way! Arrangements had been made some weeks ago for Paris, our daughters best friend to spend the weekend with us on board, in the end we had an extra member of crew for a day in Felix. All 3 of them are on the Rockley Btec course so none were novice sailors although Silhouette isn’t exactly a Wayfarer or Pico ! We were going for the 08:30 bridge lifts so at 08:10 I released all the shore lines except 1 spring using the motor to hold us against the finger. Felix asked to help so he stayed on the finger ready to cast off. At that moment the wind shifted and Silhouette decided she wanted to get going and I must admit I forgot all about Felix!!! Apparently he just made it on board with an Olympic jump…. the devil in me did think how funny it would have been had he missed, but that would have been cruel and he was trying to make a good impression on us 🙂 (So yet another lesson, get the shore lines sorted out). Charlotte soon realized Silhouette handles a bit differently to a Pico !!! With a forecast of NW3-4 backing SW5-6 later the stage was set for a great day. 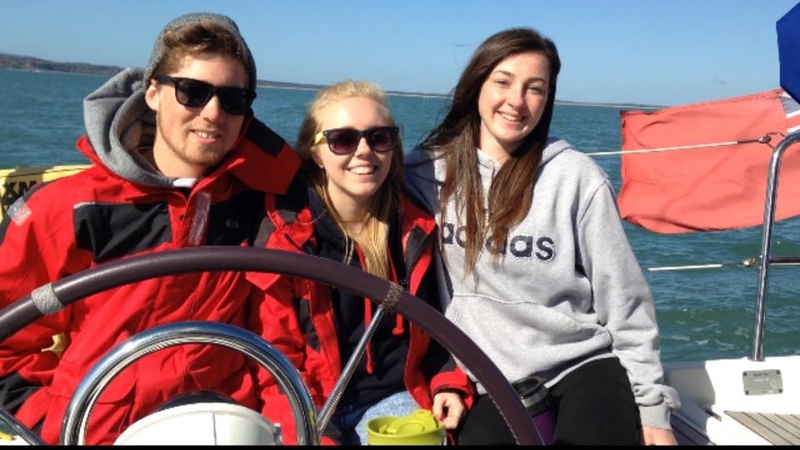 We sailed out well into Poole bay and then returned to anchor in Studland for lunch and sun bathing. 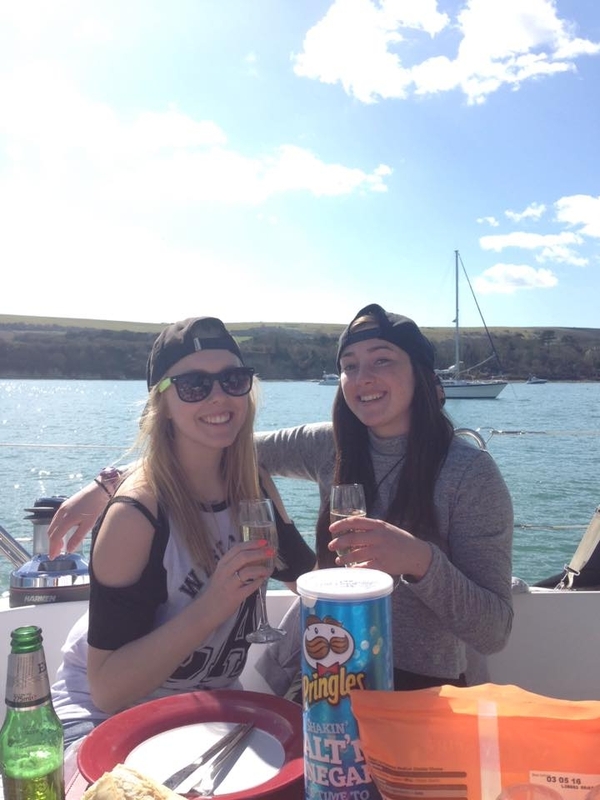 The motley crew were treated to Champagne and Pringles …… odd mix but the Champagne was to celebrate our first proper sail of 2016. The yacht in the background behind the “Charlotte and Paris” pose must’ve thought it was August though as 2 young boys jumped in for a swim with just shorts on………. CRAZY OR WHAT !!! Just after lunch the wind veered round to the SW and started to pick up, so once Felix, Charlotte & Paris had finished their photo shoot we headed back before the forecast “weather bomb”. We have a 33Kg Rocna anchor and this was the first time we’d used it, just as well we have a power windlass as the anchor had dug in really well which is very reassuring too ! Time for another lesson… don’t assume anything. When reversing back into our berth the owner of the boat next to us and his father took our lines for us. I know I was coming in spot on so why was the stern kicking over towards the yacht next to us? The helper with our spring realized his father was continually pulling the bow line which was in turn pushing our stern out. Quick remedy with the engine and a quiet word averted some embarrassment all round. So the lesson is never assume the person you’re handing a shore line to actually knows what they’re doing ! Oh and another lesson on assumptions, we ran out of gas on the Thursday night which wasn’t a problem as we had a spare gaz bottle with the seal on it. WRONG…. the previous owner had used the bottle and put a cover on that still had the seal in place. Picture the scene of me walking around the marina whilst it was pouring down looking for the night watchman to open up the stores for me…. not a happy chappie. Saturday brought the rain and wind at F7 gusting 45 kts which continued into Sunday before things got really interesting. 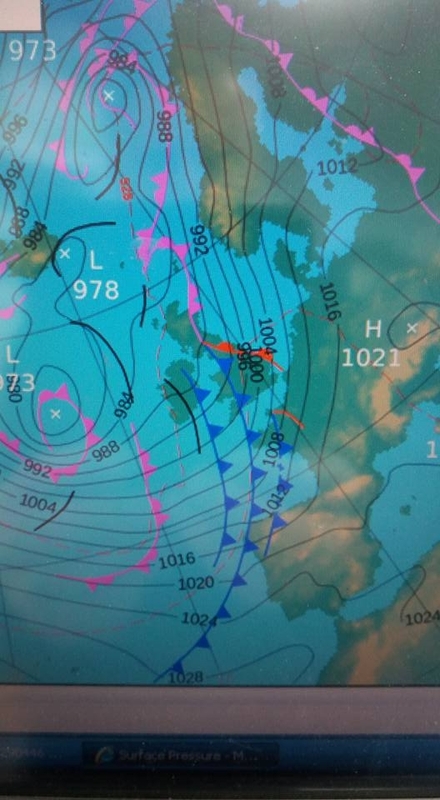 The fast moving deep depression was at Lands end at midnight and into the North sea by 11am on Monday with storm F10 winds gusting over 75kts in Poole and over 100kts in the Solent. Colin & Penny, my aunt & uncle who live/work in the Caribbean thought it would be good heavy weather close maneuvering practice ……… not only are they great sailors, they’re A list comedians too !!! 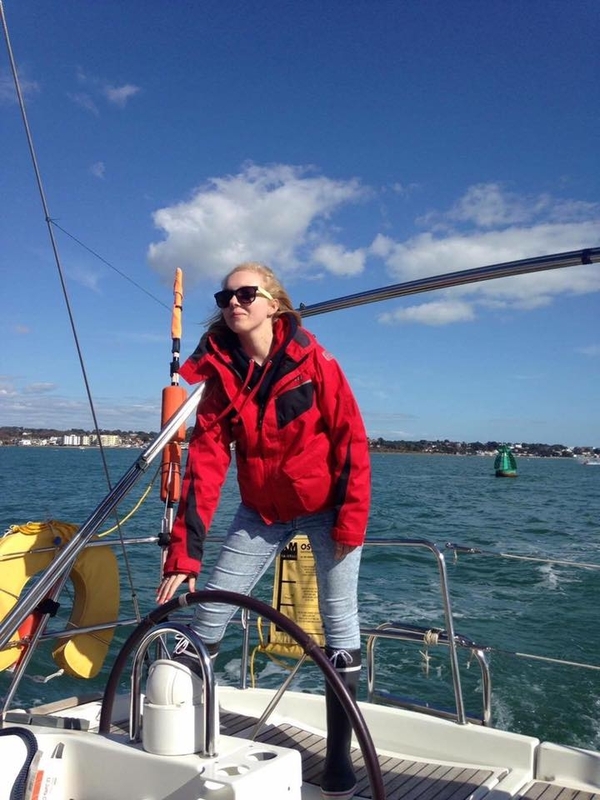 Although still very cold, the weather had improved enough to consider an early season day sail so with much excitement our daughter Charlotte and I took the winter cover off and re-attached the mainsail. With a north easterly 4-5 conditions looked great so the three of us slipped our berth and headed off for the 09:30 bridges. Having duly called Poole bridge control requesting a set of bridge lifts we were told we were the only vessel going through. As we approached the first bridge I noticed it was really difficult engaging reverse and when it did drop in there were no revs at all followed by black smoke and an oil slick…. “Dad that doesn’t look right” she said, “s*it” I thought, we’ve lost the gearbox. Fortunately we managed to tie up quite quickly to a spare RNLI pontoon and as I jumped ashore with some lines I looked ahead to see the twin sails bridge half way raised…… oops!!! Quick apology to a very understanding voice on the VHF and we turned our thoughts to the problem at hand. A phone call to the marina office at Cobbs Quay followed by a tow back to a berth and that was that, no sailing at all. 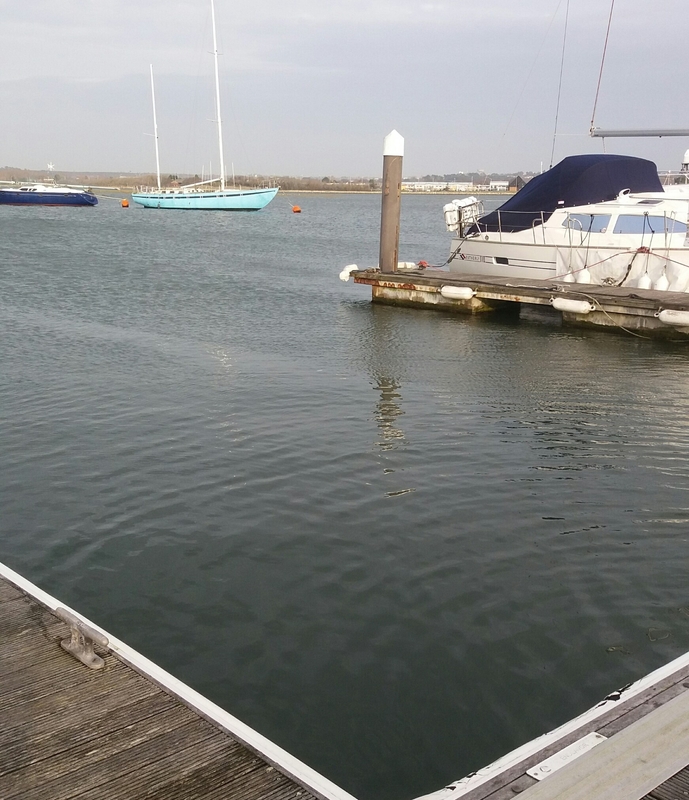 Much reading on possible issues and a phone call to a local marine engineer who took a look and the problem didn’t look like it was mechanical but more like a propeller malfunction. I spoke to the maxprop dealer in the UK “Darglow marine” who said it was unlikely to be an issue with the prop unless it had hit something and bent a blade in the wrong position. We were going to need to take a look at the prop, no lift out available until April as it’s the busy period, so it meant going under water. I got my 5mm one piece suit out, found my fins mask and snorkel………. and then telephoned a professional diver !! Its March in the UK I’m not that mad. End result was fishing net wrapped securely around the prop and shaft which took the diver 30 minutes to clear. 2 weeks later we went out to test all was ok and managed to shake the sails out before the wind died and some sea fog rolled in. No matter, easter is around the corner and there’s a buzz of excitement as the evenings draw out too ! We knew there would be a learning curve but one thing we didn’t really give too much thought to was the need to book berths in advance given our size and especailly at bank holidays. 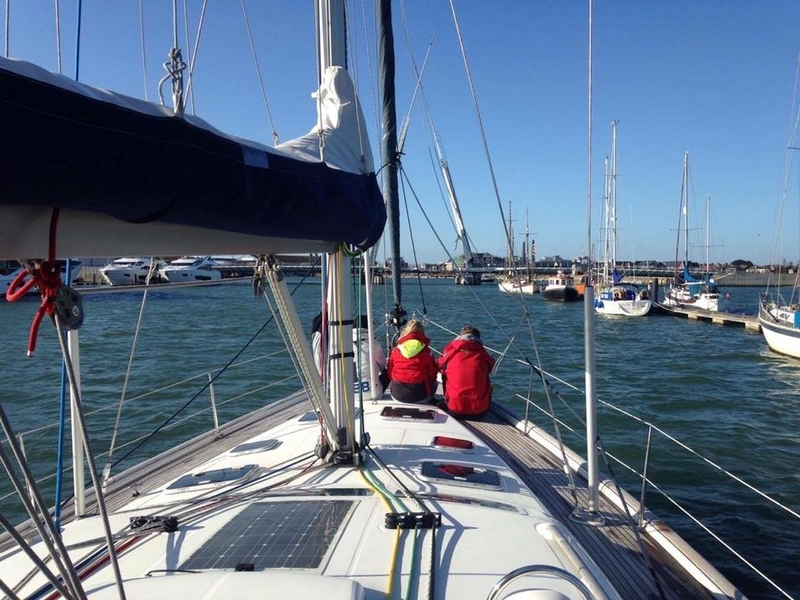 Whilst we would prefer to anchor when possible, Yarmouth on the Isle of Wight has a great harbour which fills quickly and we have managed to book ahead for the Good Friday. 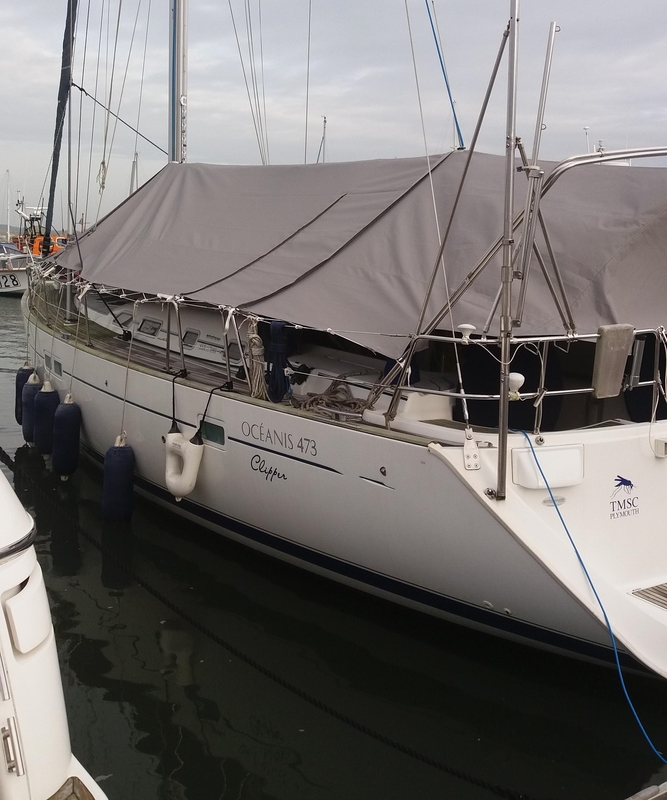 Sadly we left it too late for Lymington so have made arrangements with Hamble Point marina, last time we were there was in 1997 when we bought “Seaway Challenge” our last boat so it’ll be interesting to take a look around. With Christmas and new year well and truly out of the way, we have been looking at what jobs we can do whilst still on the water to make the “out of water” list much smaller, also making the actual time ashore less too. What looks like the biggest job is the teak decking. It’s starting to go a bit green and although It’s in overall great condition, we want to keep it that way for as long as possible. The previous owner left us some very helpful notes including the name of a teak biocide and protector called Boracol. Having washed down and “lightly” scrubbed the decks (hard scrubbing being a no no apparently) with a nylon brush which was back braking (I’m no spring chicken!) it’s now ready for application. We purchased 5 litres of Boracol online and will apply 2-3 coats this weekend weather permitting. Last weekend our permanent berth became available for us so I took the winter cover off enough to see all around and decided to fill up with diesel at the same time as moving to a berth big enough for us and with room for manouevering. Whilst the actual fuel dock is long, the width of the channel wasn’t and I knew I’d have to make a 5 point turn at least to go back. 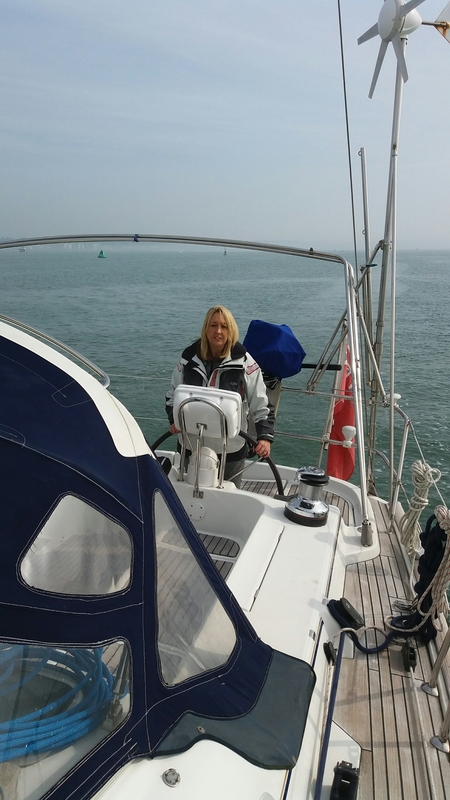 Very little concentrates the mind more than turning a 14 metre boat without a bow thruster in a narrow channel singlehanded. Filling both tanks took 347 litres, the attendant started to looked worried, I think he thought there might be a hole in the tank, at a cost of 48p per litre which i was pleasantly surprised at. Having filled up and completed my 5 point turn making the most of the huge prop walk to port, I took Silhouette to her new berth and placed her in stern first which makes boarding so much easier. The chap on the yacht next to us came out and took a stern line which was very kind and then commented how he was in awe of me moving a boat of that size on my own. To be honest I didn’t even think it was a big deal once I’d worked out the route, full risk assessment, escape vectors, life insurance cover…. oh and fenders !!! Seriously though it’s all about preparation then just getting on with it. It doesn’t matter whether you own a car, bike or yacht, the feeling in your stomach is the same when you return to where you left it …. and it’s not there any more!!! It’s not like leaving a car in an unfamiliar city centre, it’s a local marina and I know where I parked it. After what seemed like hours but was actually about a minute I saw the distinctive Rutland wind generator spinning happily…. the marina had decided to move us to another berth without letting us know. We were told this was to be our permanent berth but when I turned on the instruments it became clear there was less water in the new berth than the old one, so a quick chat with the office followed, especially as we’d just received the invoice for 2016-17 !!! We had to make the decision to put the winter cover on Silhouette despite valiant attempts to go sailing before the end of the year. Unfortunately the winds have been relentless blowing force 6 – 9 with gusts over 50 knots regularly. The cover was in 3 parts with zips and attaching points everywhere, but what a clever piece of kit. 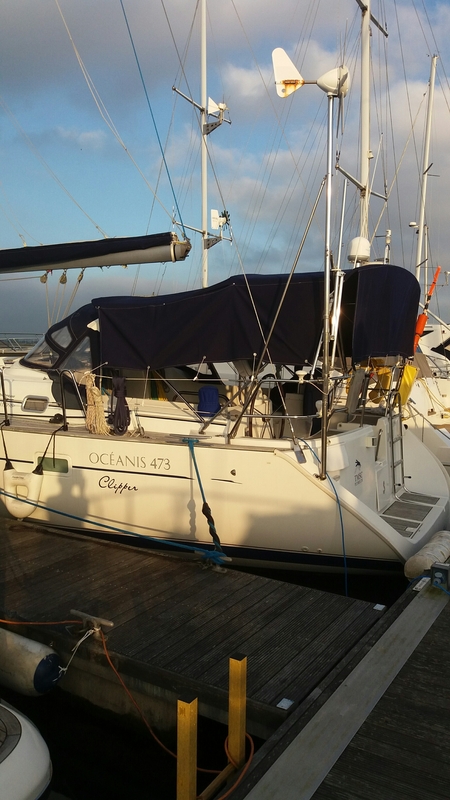 We had to remove the lazyjacks and the mainsail from the mast track but the cover goes over the boom and runs from the bow to the stern allowing full height in the cockpit. The good thing is fresh air still runs through the decks and we can work on cleaning the teak in all weathers along with polishing the top sides without getting wet. We will arrange for Silhouette to be lifted out of the water in early February for a month so we can antifoul, check anodes and the rudder bearing which was the only thing our surveyor mentioned, and by his own admission he was being picky so it may well be fine ! We always knew buying Silhouette at the end of October meant actually sailing could very well be unlikely, but we have and will continue to use the time wisely to get to know all her systems so when we “splash” in March the fun will begin without worrying which raymarine alarm sounds, such as the Raymarine smart controller sounding because Ian switched off the power supply to it !!! So that’s all for 2015, here’s looking forward to the start of the new season and the adventures begin. Author ian moorsPosted on December 19, 2015 March 1, 2017 Leave a comment on Where’s she gone? Today was quite possibly the best day weather wise the 1st November has given for years. What started as damp and foggy soon turned into pure sunshine and really warm. I decided this meant it was the ideal opportunity to see how the cockpit bimini looked with the side panels. The whole cockpit gets shaded and works brilliantly but I think there needs to be some kind of see through area so the mainsail can be seen when sailing. The side panels look odd but I guess they do their job of keeping the hot sun out whilst allowing the cooling breeze in as the early and late sun is low in the sky. Oh and following on from the last entry….. I got to push more buttons too, what a great day ! Today we signed the handover documents and we are now the proud owners of Silhouette. We arrived at Sutton Harbour where we were met by James Christian from Ancasta. An hour later he left us to admire our beautiful boat. We couldn’t wait to start opening lockers and begin putting stuff away. 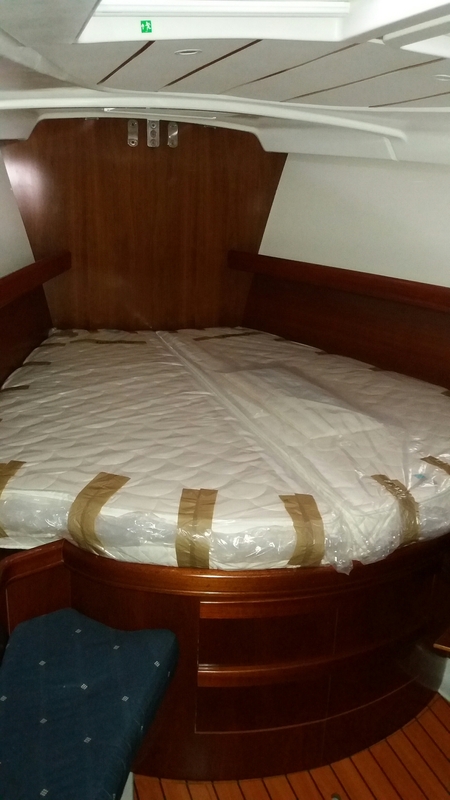 We bought a new 2.9 metre inflatable and stowed in in the starboard cockpit locker…. well we actually watched it disappear into the depth of the locker, damn she’s big !! Being a guy that loves pressing buttons, I made the mistake of switching on the E120 watching it come to life showing the interface between radar, chart and AIS. Caroline quickly chastised me and told me to switch it off and help stow belongings…. Guess she’s skipper today! 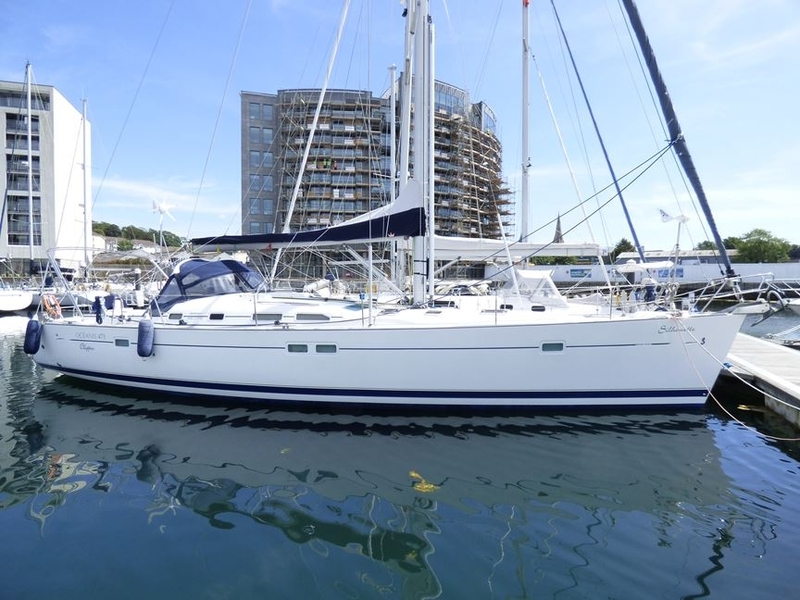 September and October have been remarkably settled weather wise with very favourable winds making the journey from Plymouth back to Poole a tempting prospect. Then the weather gods decided it was time for an autumn change and positioned a very menacing low pressure just off Lands end. We had to make a decision and it had to be based on the fact that weather windows were getting fewer as autumn started to appear and our lack of available time from work. So we decided to get Halcyon Yacht Delivery to bring her up for us. The chosen skipper Andreas Fech has decided on an overnight trip Monday/Tuesday of this week. It looks like he’s going to use the edge of the low to catapult Silhouette up the channel before the gales hit later in the week. Their reputation for care was well researched by us before giving them the job. Author ian moorsPosted on October 24, 2015 February 28, 2017 Leave a comment on Winds are changing!